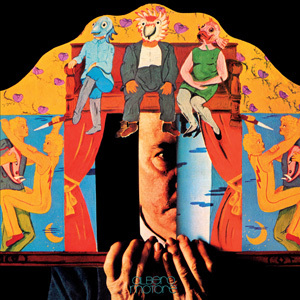 “Il grande gioco”, the only LP released by the Rome-based band Albero Motore in 1974, already issued by AMS Records on CD papersleeve format, is now also reissued on vinyl with a cover that faithfully reproduces the original one, including the inner LP envelope with photos, credits and lyrics. The group’s brief career lasted about three years, from 1972 to the breakup that occurred shortly after the release of the 7-inch “Messico Lontano / Mandrake”. “Il grande gioco” was published in the same year by two different labels, Car Juke Box first and, following the latter’s business closure, Ricky Gianco’s Intingo; Gianco was also producer and author of the songs lyrics, together with Gianni Nebbiosi. The album is distinguished by a mature and compact songwriting; its songs simply flow, gathering elements of hard and jazz-rock together with American West Coast sounds, leaving wide space to the incisive and peculiar voice of singer Maurizio Rota. There is not a single weak track in this LP, and we can only imagine what Albero Motore would have been capable of if they hadn’t disbanded so soon.